Housed in an historic building that dates to the early 1800s Gateway Lodge is located in Highmount 3.3 km from Belleayre Ski Centre and 2.8 km from Pine Hill Lake. Free Wi-Fi access is available and breakfast is served daily. The accommodation will provide you with air conditioning and a DVD player. Some rooms have a garden view. At Gateway Lodge you will find a spacious common area fireplace garden and terrace. Refrigerators are available for guest use. An array of activities can be enjoyed on site or in the surroundings including skiing cycling and hiking. Free pool and gym passes are available during the winter. 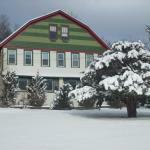 This lodge is 88 km from Albany International Airport.